BRITISH blogger Lionheart has been accused of inciting racial hatred. Do you believe in free speech? If you do, you should be angry. ICE T is a black rapper and can get away with saying such thing. Malik is a Muslim woman and cannot. 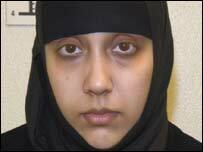 Malik was 23 when she was sent down. At that age counterculture has a pull. Are you not interested in the contents of her library? Would you rather read the Sniper Manual or the Dangerous Book For Boys and learn how to tie a reef knot? And now Lionheart has fallen foul of the thought police. “I am currently out of the Country and on my return home to England I am going to be arrested by British detectives on suspicion of Stirring up Racial Hatred by displaying written material” contrary to sections 18(1) and 27(3) of the Public Order Act 1986. The cultural weapon in the hands of the modern Jihad within Great Britain, silencing the opposition using our own laws against us – The Dumb Filthy Kaffir’s as the Moslem would say to his children behind closed doors. At least my words of truth have obviously now reached people’s eyes and ears, with the powers that be now intent on silencing me – Third World Tyranny in a supposed 21st Century democracy! Is it right that people should be arrested for writing things and thinking things that the powers that be do not approve of? Is the UK now like Saudi Arabia?